We design and offer a mesmerizing collection of designer tassels that reflect the fine craftsmanship of our adroit craftsmen. Be it mini tassels, key tassels, beaded tassels, sofa tassels, all these are known for their style and appeal. Available in a wide plethora of colors, sizes and styles, the tassels are sure to add a charming look to home furnishings. Size 10cms. & Hanger 7cms. Size: Tassel 10cms. & Hanger 7cms. Size 4.25" Tassel & Hanger 2". Size Tassel 1.25" & Hanger 1.25". Size Tassel 4.25" & Hanger 3". 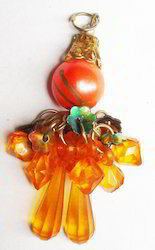 Size 2.75" Tassel & Hanger 2". Size Tassel 3.75" & Hanger 6.5". Size Tassel 6.5" & Hanger 2". Size Tasel 3.5" & Hanger 3". Size Tassel 4.75" & Hanger 2.5". 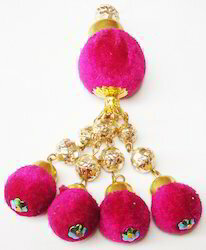 *Size Tassel 11.5cms. & Hanger 8cms. Size Tassel 9.5 cms. & Hanger 4.5cms. 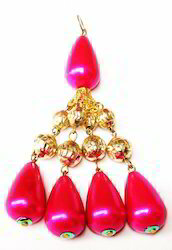 Size 4.75" Tassel & Hanger 2". *Size Tassel 4.5" & Loop 2". 1)Size Tassel 2" & Loop 3". Size 2" Metallic Ribbon, 0.5" Beaded Head & 2.25" Tassel. 1)Strong decoration for home textiles . 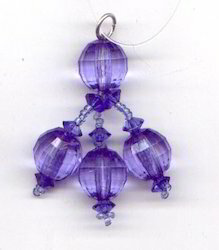 3)Top craft with fashion beads. Size Tassel 3.5" & Hanger 2". 1)Size:Tassel 10cms. & Loop 6cms. Looking for Designer Tassel ?